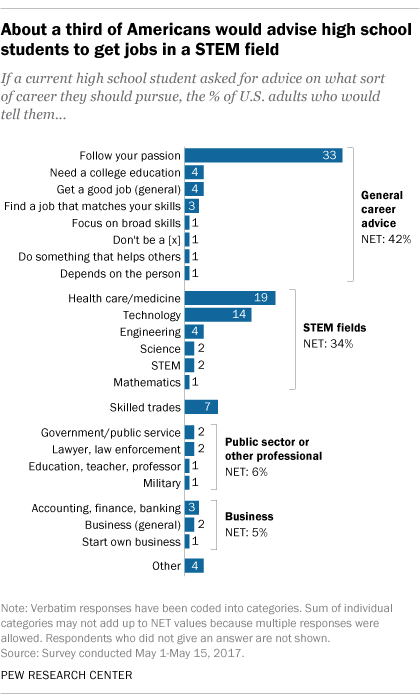 Americans tend to differ over the best career advice to give high school students, with younger adults urging them to follow their dreams and older Americans telling them they should enter occupations in the fields of science, technology, engineering and math (STEM), according to a Pew Research Center survey conducted in May. A third of U.S. adults say they would tell that student to simply follow their passion or do something they love. That response is highest among Americans ages 18 to 29 (40%), but declines noticeably among those ages 50 and up (28%). Meanwhile, 34% of Americans say they would encourage high school students to get jobs in a STEM-related field, such as medicine or health care (19% say they would suggest a health-related career) or technology (14%). 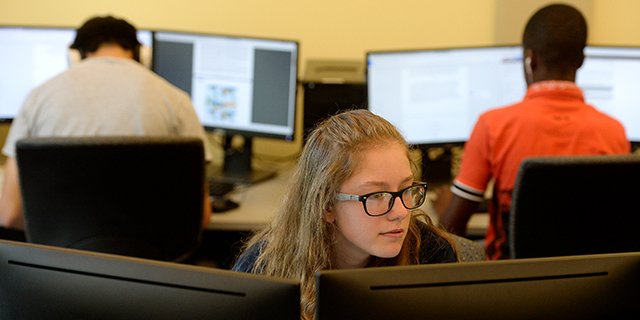 Again, enthusiasm for this career choice varies by age – but in this instance, adults ages 30 and older are more likely than those younger than 30 to promote the virtues of STEM fields (36% vs. 23%). Along with STEM fields, smaller shares of Americans would recommend going into the skilled trades (7%); getting a job in the public sector or a similar professional occupation (6%); or working in business, finance or entrepreneurship (5%). All told, 42% of U.S. adults would offer high schoolers career advice unrelated to a specific vocation or field, which includes responses such as getting a college education (mentioned by 4% of respondents), finding a good job of some kind (4%) or doing something that helps others (1%). And while there are few partisan differences in the types of fields Americans would encourage young people to enter, attitudes differ sharply by party in response to a separate question about the importance of work as a whole. Overall, half of Americans say that society does not place enough importance on working and having a job; 19% say that society places too much importance on work, while the remaining 31% think that balance is just about right. However, Republicans and Republican-leaning independents are about twice as likely as Democrats and Democratic leaners to say that society doesn’t place enough importance on working (69% vs. 35%). There is also a substantial age gap in how Americans view work. Two-thirds (67%) of U.S. adults ages 65 and older – and 55% of those ages 50 to 64 – think that society does not place enough importance on working. That share falls to just 36% among those 18 to 29.